Click here and like Axe on Facebook. 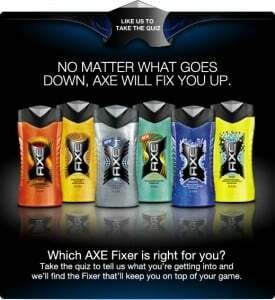 Answer their 6 questions on the “Fixers” tab and you’ll be able to request a coupon good for a full size bottle of Axe Body Wash.
My son love Axe body wash and Shampoo! Did u axe me something? It’d be great if only the site actually worked, wasted a lot of time on this! My son really loves your product. YAY I finally got it!!!!!! THANK YOU!!!! when it gets to queston it dosent do anything or go to the next quetion…??? I absolutely love Axe Body Wash when my boyfriend uses it. My son will only let me buy this for him. I love way it smells on my hubby an my sons simply love their products !! !